CHARLOTTE, N.C. (AP) Kemba Walker exhaled loudly as he pulled up a chair and sat down in front of his locker. ”We really needed that win,” Walker said. Walker had 26 points, Dwight Howard added 16 points and 16 rebounds and the Charlotte Hornets snapped a six-game losing streak with a 102-87 victory over the struggling Los Angeles Clippers on Saturday night. Walker, who was coming off a 47-point performance in a loss to the Chicago Bulls on Friday night, was 8 of 17 from the field and 6 of 9 from 3-point range despite a sprained wrist. He has made 11 of 17 3-pointers over the past two games. He said he’s finally regaining his stroke. Jeremy Lamb added 17 points for Charlotte. Meanwhile, the misery continues for the Clippers, who’ve lost eight straight games. Lou Williams had 25 points, and Blake Griffin added 19, but the Clippers seemed to run out of gas in the fourth quarter on the second night of a back-to-back. Coach Doc Rivers said the Clippers are still trying to find their identity. The Hornets led 73-71 entering the fourth quarter, but limited the Clippers to 6-of-20 shooting in the fourth quarter while forcing five turnovers. 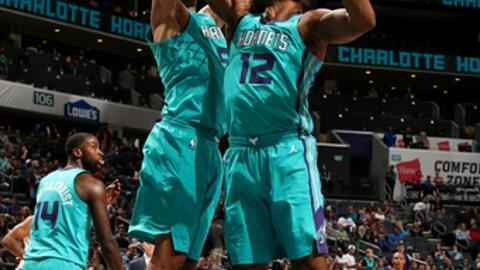 The Hornets began to pull away midway through the fourth quarter. Walker extended the lead to eight when knocked down a 3-pointer from the left wing with 3 minutes to play. Clippers: DeAndre Jordan had 10 points and 14 rebounds. … Shot 8 of 29 from 3-point range. Hornets: Jeremy Lamb left the game with a right hamstring strain. … Only had one turnover in the first half. BEVERLY EXPECTED BACK: Austin Rivers said he’s hoping that getting Patrick Beverly back for the team’s next game will give a shot in the arm to a team in need of one. CHECKING IT OUT: After committing a foul in the second quarter against Jordan, an unhappy Howard grabbed a television monitor located underneath the basket in hands waiting for the replay. Displeased with the call, Howard shook his head and returned to the court to line up for Jordan’s foul shots. Howard had a funny moment earlier in the game when he accounted for Charlotte’s only first half turnover when he inadvertently passed the ball to a wide open coach Steve Clifford. Clifford didn’t seem to be expecting the rock. CARTER-WILLIAMS PLAYS MORE: Michael Carter-Williams returned after not playing in the last two games and logged 14 minutes. That came at the expense of rookie Malik Monk, who did not play. Monk could see more time in Lamb can’t play against the Timberwolves. Clippers: At New York on Monday night.